Educational Technology is a subteam of Technology Services. We support and encourage faculty use of technology to enhance pedagogy. The following is a list of technologies we support, but by no means is it a complete list of the many options and resources available. Not sure where to begin, or interested in further information about best practices in using technology to enhance teaching and learning? Please feel free to contact your educational technologist with any questions you may have! Moodle is the university’s Learning Management System (LMS). Moodle is a platform that allows faculty to add and organize course content (resources, assignments, assessments, grade information, etc.). Moodle offers a variety of interactive components like quizzes, forums, wikis, and has integration with additional campus tools such as TurningPoint and Turnitin. For Moodle assistance, please see Moodle’s documentation or contact us. Turnitin is a plagiarism detection, writing improvement, peer review, and feedback tool. It can be accessed both at Turnitin.com and as a Moodle integration. This suite of products helps students learn better strategies for paraphrasing by viewing originality reports generated in Turnitin. While Turnitin does have a plagiarism detection component, it is still important to discuss appropriate use of sources and proper citation. Please see Turnitin’s documentation on using this tool within Moodle. 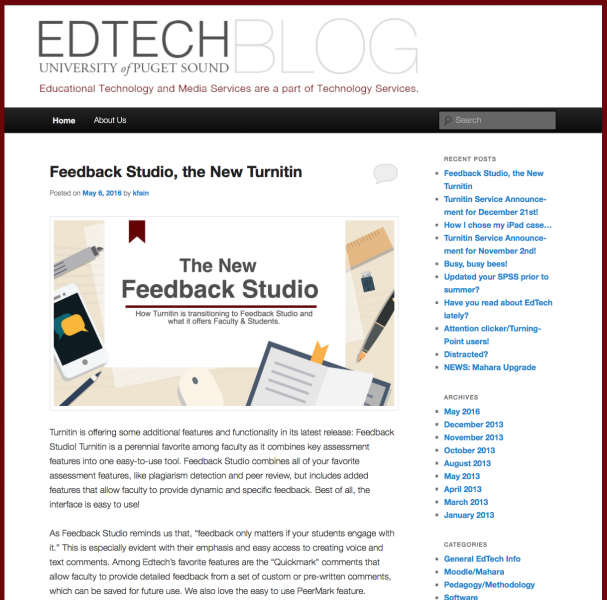 If you wish to use Turnitin.com, please contact Educational Technology to ensure proper account creation.We will be adopting Turnitin’s Feedback Studio in January 2017. 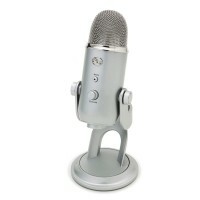 For more information on the excellent features now offered, please try the Feedback Studio Demo. Twitter and other social media networks provide opportunities for faculty to connect with students and other professionals inside and outside of class. 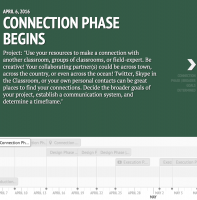 These tools can be valuable for creating professional networks and crowdsourcing ideas. For other ideas on how to use Twitter or other social media in the classroom, please contact us or read “Tweeting in Higher Education: Best Practices" for more information. WordPress is a flexible blog platform that has many useful pedagogical applications. Educational Technology supports a university installation of the program. Our WordPress environment can be configured in many different ways to allow students to engage with course content. Faculty can use it for a variety of purposes. Some examples include students being responsible for supplying class readings, interpretations, and commenting on each other’s work or on current events. This program lends itself to collaborative creation of web-based content to curate artifacts (digital or nondigital), may be a site for students to document their digital work throughout the course, build an online community, and enhance their use of resources in a meaningful, engaging way. Contact us for more information on how to create and use a university-hosted WordPress site in your class. Adobe Creative Cloud for education includes graphic design tools like Photoshop, Illustrator, InDesign, and Adobe Premiere Pro. Nearly limitless, Creative Cloud allows students to create and explore. Adobe Creative Cloud can be used to unleash students’ creative talents to develop visual representations, interpretations and analysis or reimaginings of course content. Some faculty ask students to create print advertisements or other image-heavy documents to advance their understanding of course concepts and ideas. Tableau is a data visualization software that allows faculty and students to interpret, analyze and hypothesize about data sets in an effort to ask critical questions about trends. Tableau offers many digital trainings and live sessions for both individuals and classes. Contact your Educational Technologist for more information on how to use Tableau in your course. Swivl is a robot, an app, and a cloud-based video creation and sharing system that allows a user to record lessons, and presentations. Recordings can be used for a variety of purposes by faculty, from building a portfolio of content to flipping your classroom, and can be combined with PowerPoint and other presentation slides for a complete, integrated lecture capture system. Contact us to learn more about using Swivl in your courses! GoToMeeting/Skype™ allow faculty to bring guest speakers to their class for students to engage with field experts (authors, researchers, etc. ), and be able to connect the work they’re doing in the course with an external person. Contact Media Services to schedule a GoToMeeting or Skype™ call during class. Please note that this request does require additional setup time, test calls, and software installation prior to your scheduled event. You should be prepared to schedule these items well in advance of your session. Video Editing allows students to tell a story, create a meaningful way of responding to prompts, and can be useful for self reflection. Educational Technology’s Digital Media Lab has several basic, and high-end video editing softwares to help students and faculty create meaningful interpretations of coursework in video format. We support the following video editing software: iMovie, Final Cut Pro X, Adobe Premiere Pro. Ask your EdTech about additional ways that we can help train your students or enhance your existing coursework with video creation and editing. Audio Recording can give students opportunities to reflect, practice language, and give oral arguments, among many other activities. Students might be given a podcasting assignment where they will research a topic, and create a podcast segment that discusses the issue in-depth. Foreign language students can practice pronunciation, and other students may create digital storytelling projects or oral histories. We offer several audio recording options on campus, including: Audacity, Garageband, Moodle. Educational Technology is here to assist with the creation of digital audio assignments and trainings. Timeline Software can be a great way for students to create and prove historical arguments, see and analyze change over time, and understand chronology of events. Educational Technology supports a variety of timeline software (Timeline JS, Timeglider, Tiki-Toki), and can provide training, consultation and support for choosing the correct tool for your course goals. 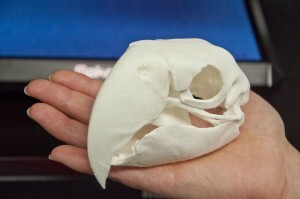 3D Modeling & Printing is a developing area of interest and support for campus. Print and Copy Services has a 3D printer, and the Digital Media Lab has several 3D modeling softwares (Blender, Sketch-Up, and Sculptris). Take notes, brainstorm, and share information using Coggle! Coggle is a mindmapping tool that allows students, staff, and faculty to organize and share their thoughts. Using a Gmail account, students and faculty can access a free version of Coggle, store their work in Google Drive, and give one another edit or viewing access (please see "Student Privacy and Technology Use" for more information third-party resources). For more information on Coggle, see our review in the Edtech Blog!